In today’s market, niches can open, rise, consolidate and collapse before an entrepreneur gets off the ground. Such was the story of Blue Apron Holdings (NYSE:APRN). Blue Apron was founded in 2012 and pioneered the idea of “mealkits,” pre-packaged food, with recipes, ordered online by subscription and delivered, that you can cook at home. It seemed highly innovative. I subscribed briefly and enjoyed it. But the techniques were simple, the ingredients expensive, so I put the recipe card away and went to the store myself. That is what everyone else did, because Blue Apron stock has gone almost straight downhill from its IPO in June 2017. It fell below $1 per share early on Dec. 18. It began trade Dec. 20 at about 80 cents. 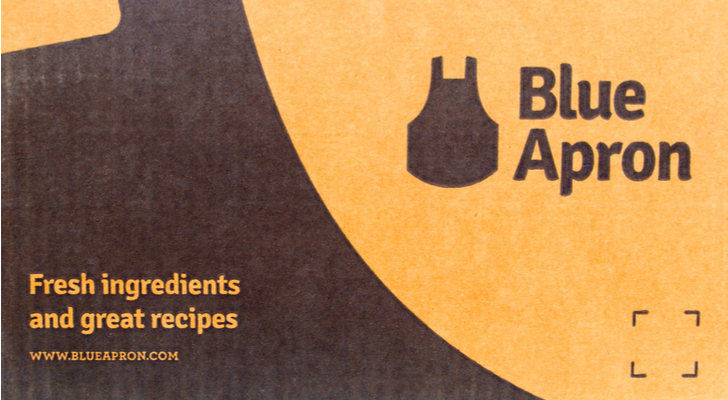 Blue Apron delivered top-line growth, but never figured out how to make a bottom-line profit. Sales were $340 million in 2015 and grew to $881 million in 2017. They were $526 million for the first three quarters of 2018. But Blue Apron lost $210 million in 2017 and had lost almost $100 million through the first three quarters of 2018. While the company scaled on the front end, with its subscription order system, and on the back end, with its delivery system, it couldn’t scale in the center, where the food was processed. This is where restaurants and grocers make their money. This is where Blue Apron lost its. Blue Apron’s supply chain, logistics and manufacturing were never able to cut costs to a profitable level. Fresh food is notoriously difficult to handle cleanly at scale, and Blue Apron wound up with the same salmonella problems that nearly killed Chipotle Mexican Grill (NYSE:CMG). Efforts to speed up production ran the company into labor difficulties. Restaurants stock ingredients in refrigerators and only process food when they get an order. This was the heart of the Blue Apron subscription idea. But churn killed that, and Blue Apron was left with the same problem of stocking and spoilage every grocer knows only too well. APRN couldn’t patent the idea of preparing meals and quickly found itself with a host of competitors, most of whom hit the same potholes it had. Companies like Hello Fresh, Plated, Fresh Direct and Home Chef appeared even before the IPO, and some disappeared before the ink on it was dried. It was when big supermarket chains like Kroger (NYSE:KR) and Walmart (NYSE:WMT) began stocking mealkits in stores that the fall of Blue Apron became obvious. The subscription model was always flawed, as Blue Apron has suffered enormous churn with most customers, like me, cancelling after just a few months. When fast food chains like Chick Fil A started selling kits out of their restaurants, the end was near. APRN tried to respond by being more flexible, even doing deals with Costco Wholesale (NASDAQ:COST) and Walmart’s Jet.com, but it couldn’t handle the fulfillment, and the Costco deal has already collapsed. Webvan was a product of the dot-com bubble of 20 years ago. It was an online grocery store in the days before most people even had broadband. I placed an order with them, and the happy delivery person even gave the kids free water, but the company was too early to the market, it couldn’t scale successfully, and it collapsed with the stock market. Blue Apron stock was the same sort of thing. It sounded like a great idea, but it lost money on every meal, while trying to make it up on volume. Breaking bulk on fresh food is best done in a store or a restaurant, not in a warehouse. Amazon (NASDAQ:AMZN) take note. Dana Blankenhorn is a financial and technology journalist. He is the author of a new mystery thriller, The Reluctant Detective Finds Her Family, available now at the Amazon Kindle store. Write him at [email protected] or follow him on Twitter at @danablankenhorn. As of this writing, he owned shares in AMZN. Article printed from InvestorPlace Media, https://investorplace.com/2018/12/lessons-learned-from-the-rise-and-fall-of-blue-apron-stock/.